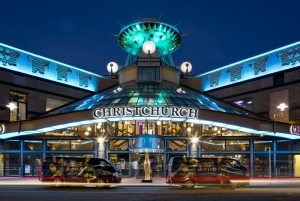 It's not a huge gambling city, but Christchurch Casinos still offer a few late-night places to go and have a flutter. Stay in the CBD for all the glitz and glamour, or venture out to some more intimate slots and tables in the suburbs. The main one is in Victoria Street in the CBD. It has three restaurants, 500 slots, and 34 tables. The casino hosts the annual New Zealand Poker Championships. You'll also find a few bars in the suburbs that call themselves casinos, but they actually only have a few slot machines, no tables. Although they serve food and drink, they're certainly not casinos in the proper sense of the word. The Victoria Street casino gets very busy on Friday and Saturday nights, but it's open all day, every day. So if you are feeling lucky, exploit the atmosphere and make a night of it. Patrons have to be aged 20 and over to enter New Zealand casinos.